Sylvanus is one of the playable Gods in SMITE. Sylvanus releases wisps that seek out nearby allied and enemy gods. Allies are healed and protected while enemies take damage over time. The initial wisp heals allies and damages enemies for twice the normal amount. 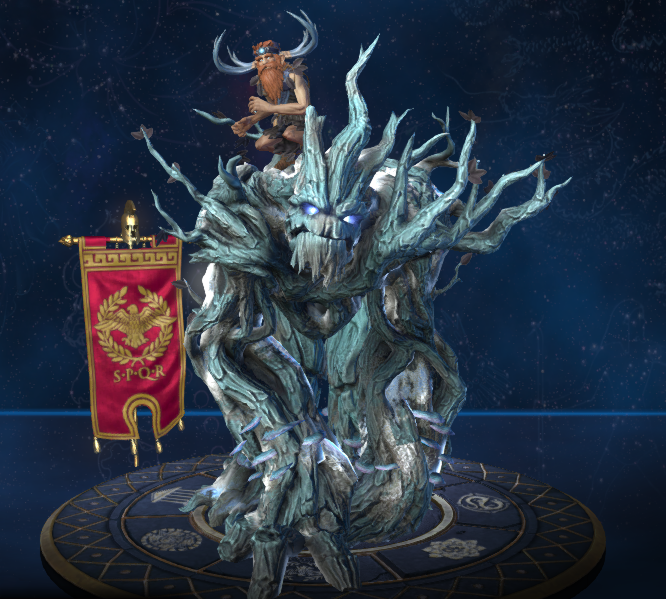 Sylvanus is immune to crowd control for a short duration after using this ability. 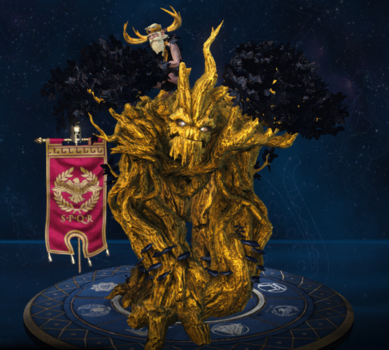 As Sylvanus knock up three or more enemy gods with your Ultimate. Curiously, Sylvanus doesn't have an Greek counterpart, altough he borrow some elements from the god Pan (who was named Faunus by the Romans). Sylvanus' treant is called Grover. Grover was voiced by the famous voice actor Christopher Sabat, known for his role as the voice of Vegeta in Dragon Ball Z.
Christopher Sabat also has voiced Anhur, Fenrir, Geb, He Bo, He Bro He Bo, Infinity Wave He Bo, Moonlight Love Chang'e's bunny, Countess Chang'e's bunny Spellbound Chang'e's bunny and Zeus. Sylvanus' treant, Grover, appears as a playable character in Paladins, another game made by Hi-Rez Studios. 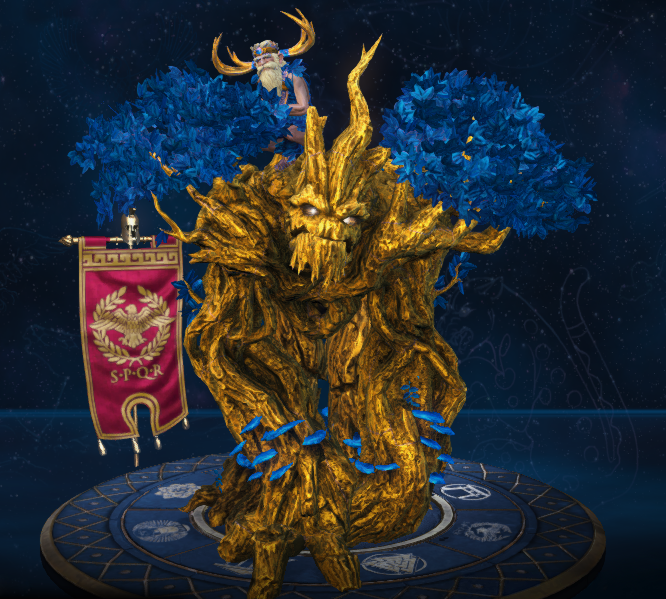 Sylvanus' victory screen is a reference to the Guardians of the Galaxy movie. This is further referenced in one of his introduction voicelines. 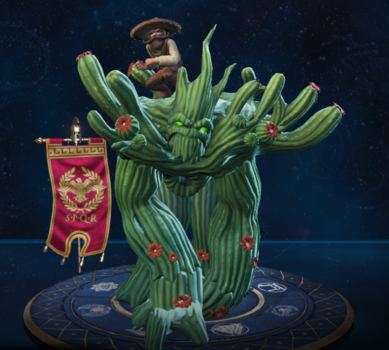 In Paladins Grover has a similar Skin to this one. In this skin Sylvanus is dressed like Santa Claus while Grover is decorated like a Christams Tree. 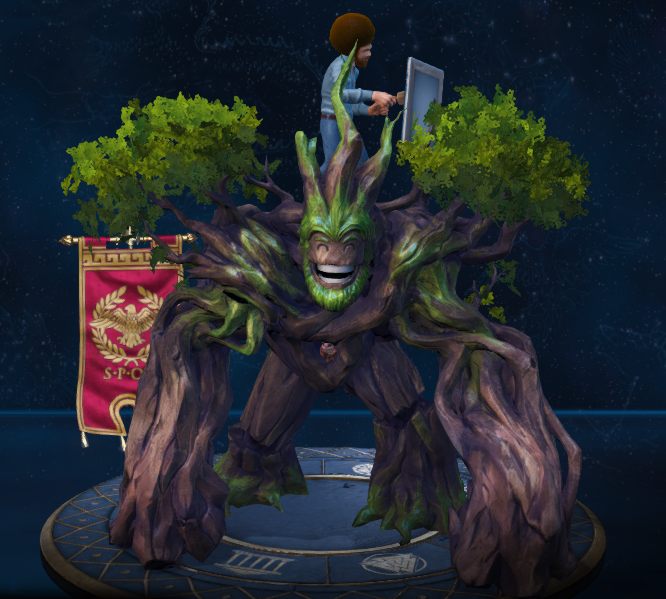 In this skin and his default skin Sylvanus is voiced by Bob Reed,and Grover by Christopher Sabat. 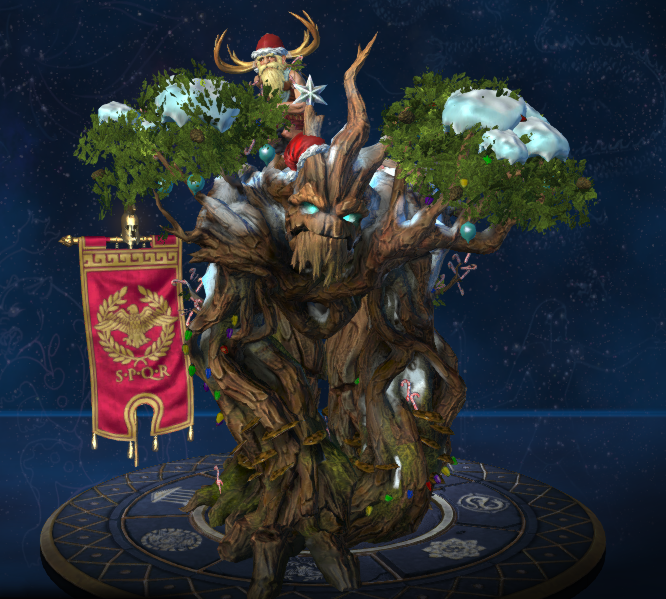 This skin share its theme with Father Chrishmash Bacchus, Krampus Cernunnos, Slay Bells Chiron, Wreck the Halls Fenrir, Snowman Geb, Jingle Hel Hel, Jingle Shells Kuzenbo and Nice and Naughty Nu Wa. This skin is based on a Cowboy. The original concept for this skin was created by Robert Koziel. He also made the original concepts for Black Knight Osiris and Chef Vulcan Vulcan. The actor who voiced this skin, Mike Pollock, also voiced Kuzenbo. This skin was based on the late painter Bob Ross. This skin was created as a cross promotion between Hi-Rez and Twitch. This skin was based on a Mad Scientist. 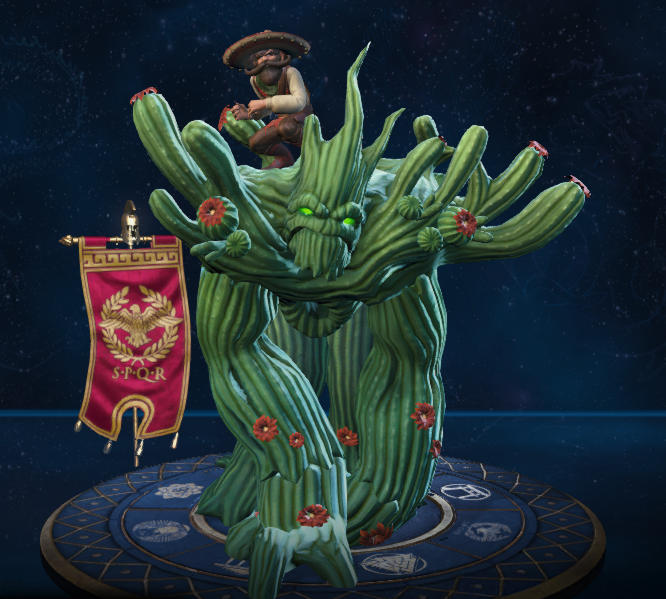 The actor who voiced this skin, Lucien Dodge, also voiced Pip in Paladins. This skin share its theme with Dr. Madlove Cupid. 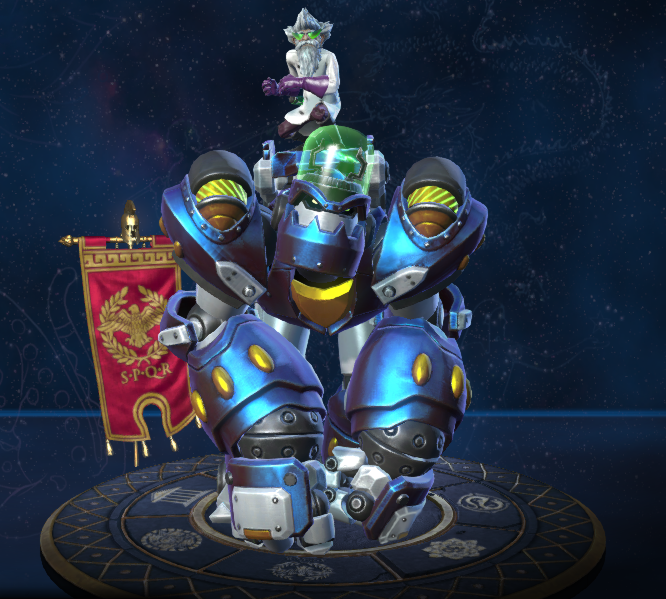 This skin was part of the Bob Ross bundle. 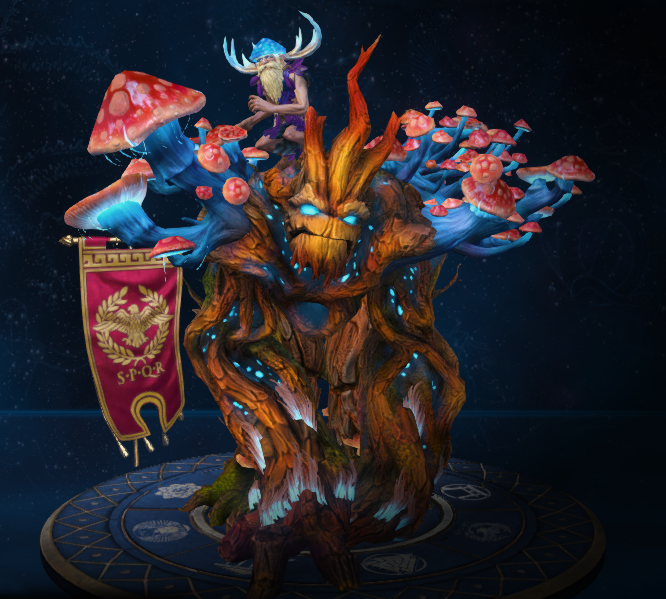 This skin could only be obtained by gaining at least 10000 fantasy points in the Season Ticket 2015. Increased Cooldown from 12s → 16/15/14/13/12s. Decreased Base Magical Power from 38 → 35. Fixed an issue where this passive was recharging at the incorrect rate. Reduce time seed take to sprout from 12s → 5s. MP5 increased from 6/10/14/18/20 → 20 at all ranks. Reduced cooldown from 26/24/22/20/18s → 22/21/20/19/18s. Reduced mana cost from 70/75/80/85/90 → 70/65/60/55/50. Fixed lighting issue for Dr. Vanus Defeat screen. This Passive now only triggers on melee Basic Attacks. 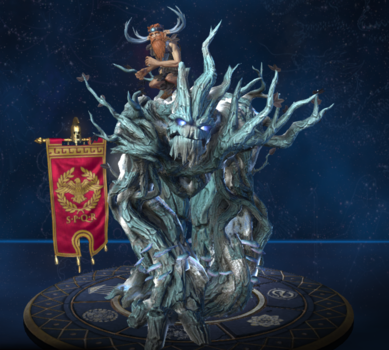 Sylvanus' Basic Attacks no longer knockback minions. Fixed an issue where this ability was not contributing to lifesteal correctly. 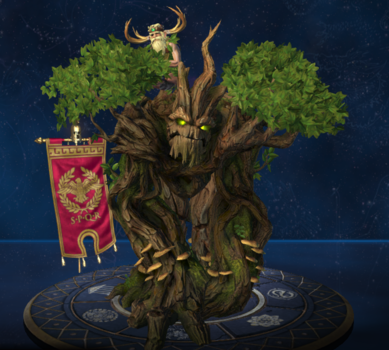 Fixed tree roots showing underneath the pedestal in the match looby. Improved targeting in relation to hitting Towers. Root duration reduced from 2s to 1.25s. Healing reduced from 25/35/45/55/65 to 25/30/35/40/45 per tick. Cooldown changed from 18/17/16/15/14 to 18s at all ranks. 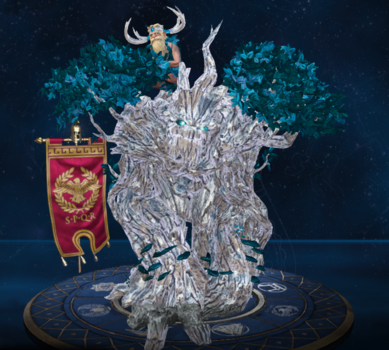 Fixed an issue where if stunned right after casting wisps, Sylvanus would still receive the healing himself, but the ability didn't go on cooldown. Reduced range on Sylvanus basic attack to 40.